You are here: Home / Firearms / Smith & Wesson M&P 2.0 Arrives! 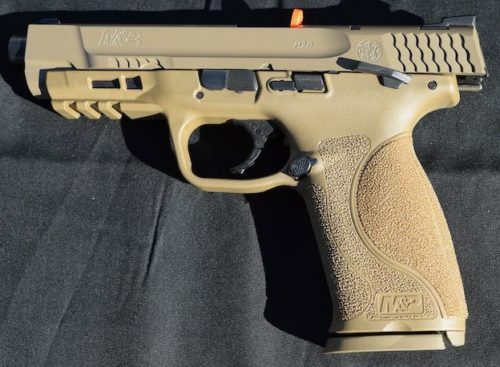 The new M&P 2.0 pistols come in black and tan. 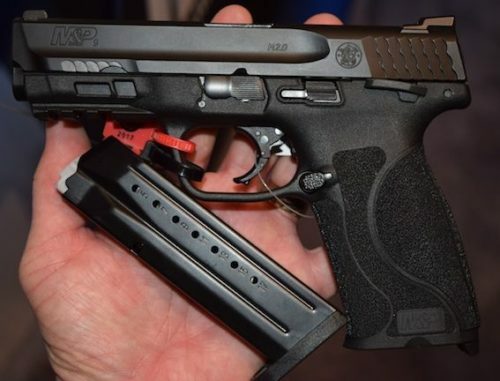 The arrival of the M&P 2.0 has been anxiously awaiting by many handgun enthusiasts. It is another power move by Smith & Wesson to continue carving a significant space in the striker fired pistol market. The original M&P, despite the unfavorable features, has been a very big success for the company. The arrival of the M&P Shield and Bodyguard have created a full range of carry options from CCW to duty to competition. The M&P 2.0 will maintain the outstanding 18-degree grip angle that has made the M&P line famous, along with most of the features that have made this pistols so popular. However, the engineers and design team at Smith & Wesson have given the M&P pistols a full overhaul from top to bottom. The M&P 2.0 has been improved dramatically, with glassy smooth pull, a crisp break, and extremely short and smooth reset. The M&P 2.0 has enhanced the trigger. Though the appearance is similar to the 1.0 version, with the 2-piece trigger safety and trigger mechanism, S&W has perhaps solved the trigger question once and for all. The new trigger has all but removed the tactile feeling to bring the trigger safety in line and fixed with the trigger itself. I worked the trigger over a dozen times very carefully examining the feel. Having a Smith & Wesson M&P Shield I am very familiar with the original trigger. Another look at the much improved MP 2.0 trigger (both pistols are black but the picture above this one is in the bright desert sunlight). The new M&P 2.0 trigger is glass smooth from initial contact to the point of trigger break. I could barely feel the slight change as the trigger safety bar engaged the trigger. Once engaged the trigger glides backwards in a very smooth pull with a slight, but noticeable, uptake of resistance just before the trigger breaks to fire. This increased pressure just before trigger break is fine with me. With proper training it allows the shooter to know precisely when the shot will fire, and this tactile knowledge can be advantageous to avoid jerking shots from improper trigger control. Trigger reset on the M&P 2.0 was fantastic! Unlike my M&P Shield, that has a smooth but noticeable travel distance for reset, the M&P 2.0 pistols have a very short and smooth reset. The reset is both tactile and audible allowing the shooter to positively know when the pistol is back in battery. 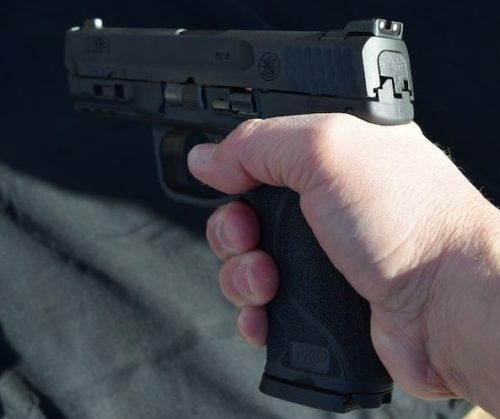 The M&P 2.0 enhanced grip texture firmly grasps the shooter’s hand, but is still quite comfortable to hold. 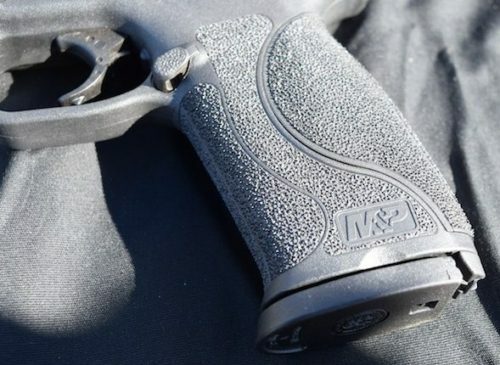 The M&P 2.0 grip texture is another excellent improvement for the M&P line. Unlike the mild and rather smooth texture of the original M&P pistols, the new M&P 2.0 takes on a much more aggressive feel while still maintaining a very comfortable bare handed grip. The difference is remarkable, and provides the shooter with a much greater confidence in pistol control over rapid fire scenarios. The new M&P 2.0 has (4) palm swell grip options (S, M, ML, L). 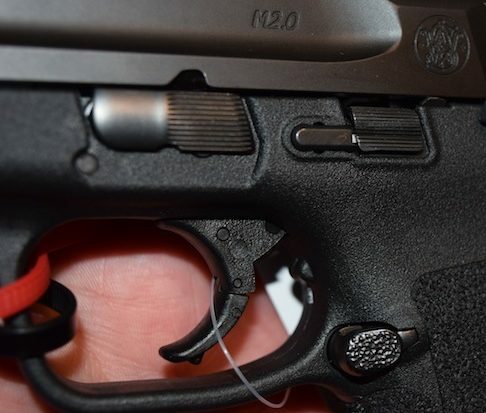 The M&P 2.0 will also have (4) palm swell grip additions instead of just three. The M&P grip size pieces will come in S, M, ML, and L sizes that should properly fit just about every shooter’s individual grip needs. The palm swells are not just extensions on the back strap of the grip. Instead, Smith & Wesson curves the sides of the palm swells to more naturally envelop the shooter’s hands when gripping. The difference over straight grip additions is very noticeable, and much nicer. The 2.0 steel chassis will now run from the front edge of the Picatinny rail to the far rear of the grip. One of the original design components of the M&P line of pistols was using a steel chassis embedded into the polymer frame. This chassis provides continuous support to the frame, the locking block, and the sear housing. By using a boxed chassis, the pressures and bending of the polymer from firing are much more controlled, providing the shooter greater recoil management according to some. The new M&P 2.0 chassis goes beyond the original chassis by extending from the chassis from the front edge of the Picatinny rail to the rear of the frame. This creates a chassis that covers the length of the frame. By extending the chassis the M&P 2.0 now provides chassis support for any light or laser accessories that may be added to the pistol. This is another foresight engineering design by Smith & Wesson to ensure proper firing, cycling, and recoil management with additional accessories being added to the base pistol. 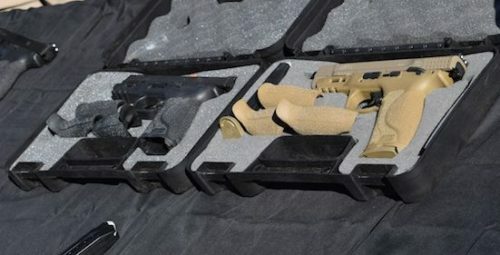 To be compliant in restrictive States, the M&P 2.0 will have an external safety lever option (here in FDE). Smith & Wesson has gone a step further by upgrading two important controls. 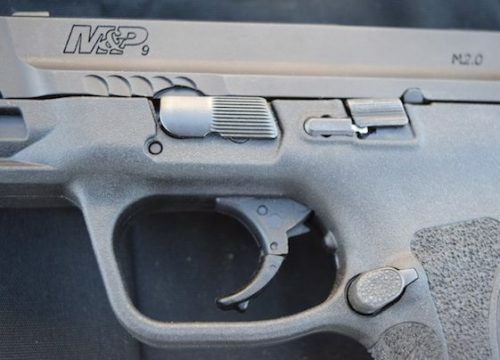 First, the M&P 2.0 responds to several customer feedback concerns over the potential of the M&P to have a hammer slide release. In essence, if a magazine is inserted with considerable force (something very likely in a real life deadly force encounter or competition shooting), there was a potential the force could release the slide lock lever allowing the slide to move forward, chambering a round, and returning to battery before the shooter was ready. The slide lock plunger is located just in front of the slide lock lever. The magazine release lever is now steel. To correct this concern, Smith & Wesson has included a steel slide stop plunger. The plunger is located just in front of the slide stop lever and provides constant pressure on the slide stop lever while the slide is locked open. This prevents the slide from having a hammer release, but will easily disengage as soon as the shooter pulls the slide back to return to battery. Next, the magazine release lever has been upgraded to be made from steel instead of the original polymer design. This steel component should provide consistent magazine releases for the duration of use, with a much reduced potential for adverse wear. 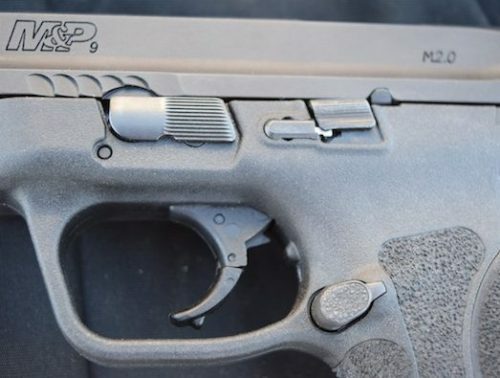 The M&P 2.0 front slide serrations were O.K., but seemed to be there for looks. Forward slide serrations and a 3-position Picatinny rail compliment the 2.0. One does not simply interrupt Miculek when he’s setting a new world record! 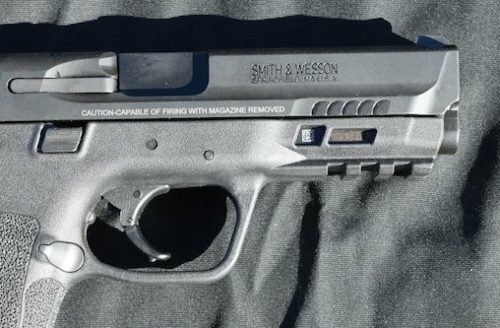 Smith & Wesson had their M&P 2.0 out for the media to shoot and try out. Unfortunately, the booth was always packed with long delays. 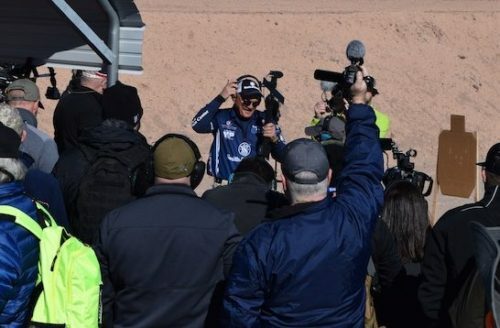 Having a very busy schedule that day, and suffering one long delay so S&W Professional shooter Jerry Miculek could set a new world record on some kind of AR-15 shooting exercise, I was unable to test fire the 2.0. However, everyone I talked to who was diligent enough to wait in line said they were very impressed with the M&P 2.0 performance. They were especially complimentary of the enhanced trigger and enhanced grip texture. Gripping the M&P 2.0 was an absolute pleasure. I’ve liked the Smith & Wesson M&P pistols since they first hit the market. Their grip (even the older version) was very comfortable and natural in my hands, and at the time was probably the best I had felt in a pistol. The texture was not perfect, but the ergonomics could easily make someone overlook that short coming. The original trigger; however, was a little too squishy for my tastes. The second generation of M&P pistols had a strengthened trigger safety spring that made the trigger much better, but still not great in my opinion. My M&P Shield has this 2nd generation trigger, and I can shoot it fine. Though there is still the moment of build up and hesitation right before the trigger breaks that can be distracting, and the reset is not as short and crisp as I would like either. Transitioning to my support hand felt very secure and comfortable as well. Finally, the M&P 2.0 has answered all of these concerns and more. The 2.0 trigger is smooth, consistent, and breaks with just the slightest build up. Trigger reset is fantastically short and crisp, with both an audible and tactile announcement of when the pistol is ready to fire again. Smith & Wesson really did the trigger right this time. 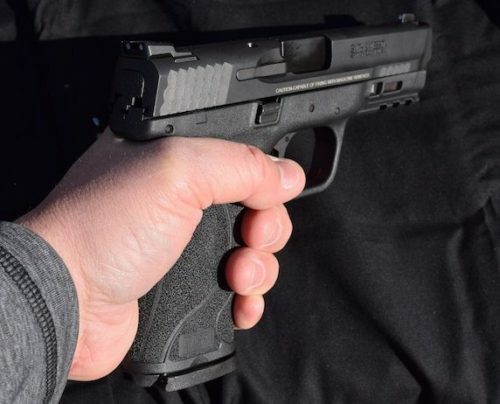 The enhanced grip texture, and additional palm swell size adjustments have not only improved on the already good grip of the M&P pistols, but made them even more customized to the different sizes of shooters’ hands. The full length steel chassis raises the rigidity of the pistol when rapid-firing, allowing the shooter to maintain more control during recoil. The stainless steel upgrades and Armornite finishing tops off the long list of improvements. Overall the M&P 2.0 is a hands down winner in my opinion. Current models are full size pistols, but I’m sure Smith & Wesson will release mid-size and compact versions in the future. In addition, look for the Shield and Bodyguard to benefit from these engineering advancements as well. The M&P 2.0 9mm with its companion 17-round steel magazine. Holy Cow! Trigger went from 7.5# to 6# in the 2.0……..Seriously S&W?!?!?!? Go back to the drawing board, and don’t come back with 3.0 until you can match a Walther or a Glock trigger…. In all fairness Glock’s standard trigger pull is 5.5 pounds and the Walther PPQ M2 is around 5.6 pounds. The M&P 2.0 is not as light, but not that far off either. I can say that pulling the trigger many times at SHOT Show the 2.0 was smooth, and crisp without unnecessary build-up or creep. It is much better than the original, and the upgraded 1.0 version. Reset was very quick and smooth as well. Yes, but still, there is a reason why Walther triggers are legendary “out-of-the-box”, and there is an aftermarket business built around improving Glocks. When you are paying 5-600$ for a pistol, “not-that-far-off” is not acceptable. Hence the reason Apex already has the fix in stock and on sale, to eliminate the “not-that-far-off” factor. I come from a generation where do it right the first time was the only way. Perhaps, the reason why Walther has drastically limited it’s partnership with S&W. 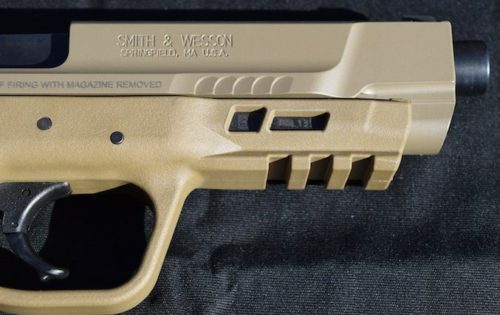 When Smith can achieve that buttery smooth 5-5.5# out of the box like Walther, THEN, they will have my attention, and I will buy American again. Marketing and corporate Hoopla, are….just that. Applaud the effort on Smith’s part, but it’s still mediocre. Walther triggers are very good indeed, I was simply pointing out the pull weight being less than 1/2 pound difference is not a significant difference. I’ve used a Glock for 17 years. The trigger was “good” (not great) when I started, and I’m definitely accustomed to it now so it doesn’t bother me. The Glock trigger is much better than the DA/SA trigger I came from, though it is not as smooth as Walther or HK. 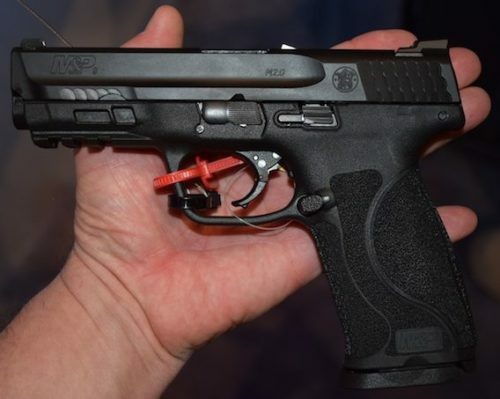 Have you tried the M&P 2.0 trigger yet? If not, I think you might be surprised at the improvements over past M&P designs. Not yet Aaron, I haven’t found one yet. I will put it on my list & keep an open mind. Your comments inspire me though, and I realize I need to keep an open mind…Thank You! Local gun range had the m2.0 for demo shooting. I dry fired it 5 times and then loaded up the 10 free rounds. Simple natural grip and trigger finger placement. Then proceeded to put 9/10 rounds all touching. Only had one round a little left and low by 1/4″ from the tight one group. Again I point out that I didn’t change grip or trigger finger placement. Normally with my Glocks I need to slightly adjust / correct my grip and even apply a little thumb pressure with my support hand. This m2.0 fit my hand really good. Trigger was simply proper. I normally run a ghost trigger in my glocks with polished parts and lighter spring. This m2.0 was the best cold out of the Box pistol trigger I’ve shot. I don’t think I would even change the parts, just polish it up. Smith did a good job with this gun. Great first-hand information on the 2.0 Wes, thanks!